My growing pain of not having a fun little ride started to really get bad about 3 months ago. I found myself watching youTube vids of awesome x 1/9 hillclimbers, a few more recently done swap/mods and a few K24/K20 installs. I had been fascinated with a racing team PrayoontoRacing and his under 10 sec all motor K series engine cars. Pretty amazing. I guess these guys were the first under 10 sec k-series in competition and are continuing to break records. 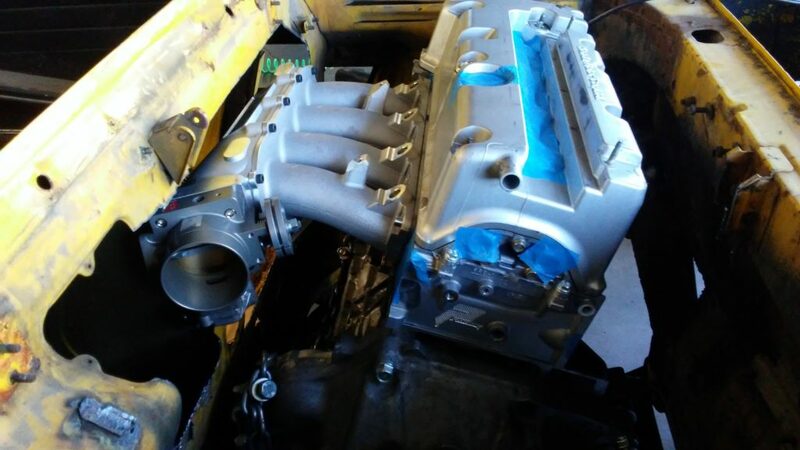 After some chats with my tuner @ DnR in Hayward, it turns out Edwin knows and does business with Prayoonto and he sold me on a total all motor build that would be as fast or as powerful as my last build for a ton less money (engine, rotrex, etc., – mostly the supercharger bits). 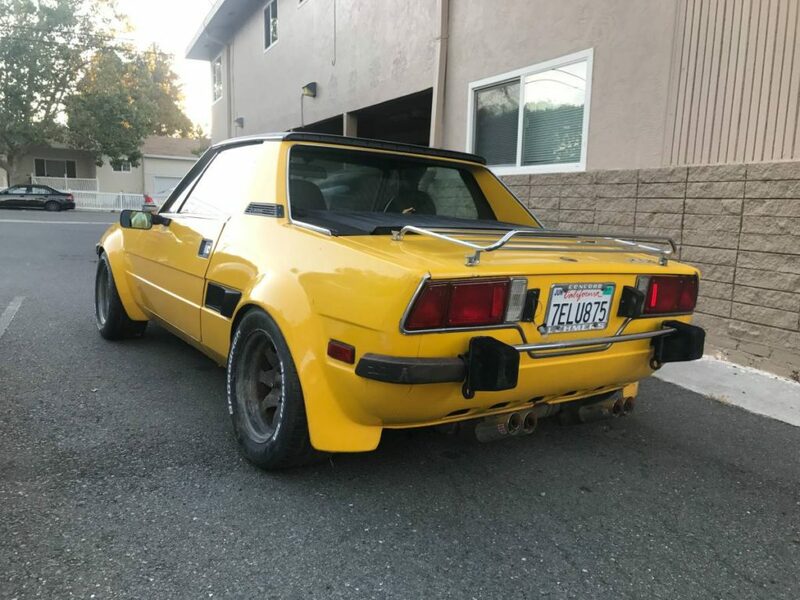 Out of the blue, I also got an email from an old Fiat bud who had word of a 1974 Fiat x 1/9 (first year imported in US) that was rotting down in Morgan Hill in need of a home or going to the crusher. I decided to take a peek and after some back and forth, I picked it up and took it home. Next day, I picked up a k20a2 head and a k series 6 speed trans. The head I dropped at DnR and Edwin sent it to Prayoonto. The trans I loaded with the car and took them up to my brother’s shop in Cameron Park European Performance, home of HooverSpeed Racing. 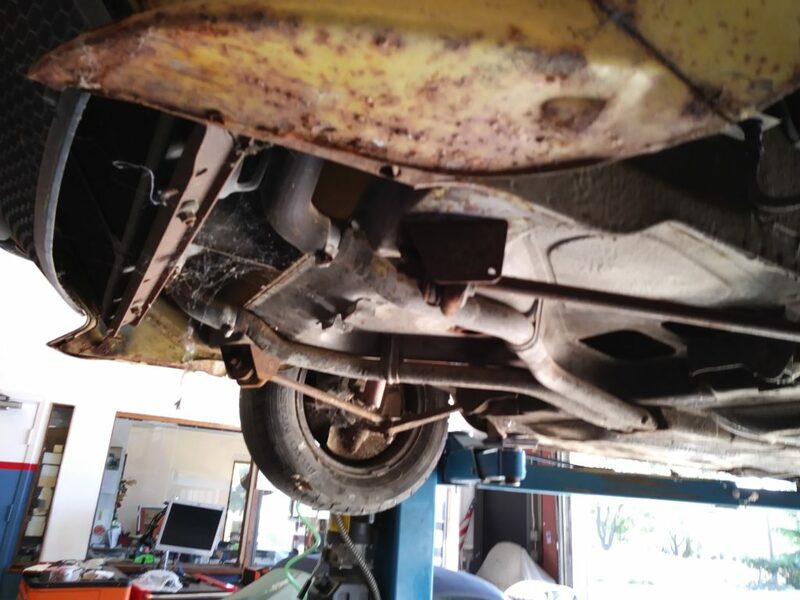 Car was delivered and stowed away to await it’s rebuild and resto-mod. The car itself, looks a mess. There are some tell tail signs of severe cancer, mainly in the rear boot. 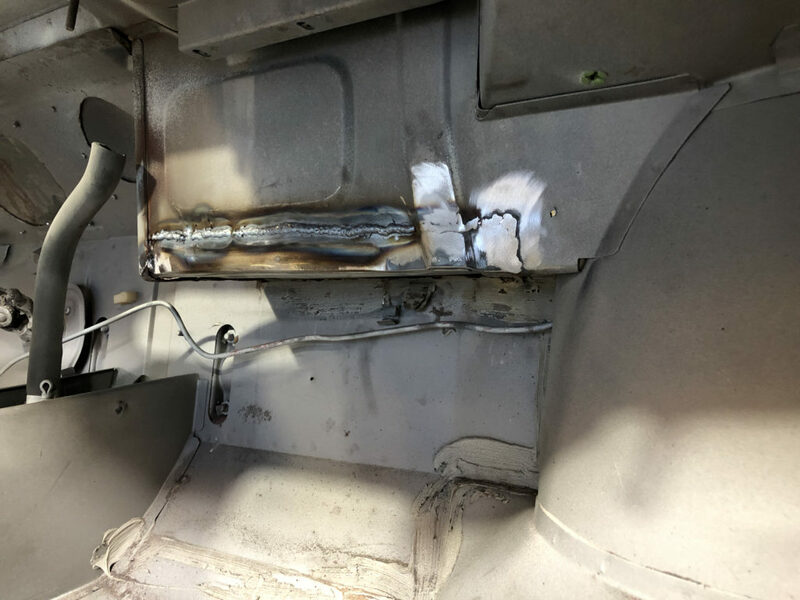 So bad, the prior owner welded a “chassis” bar to firm up a part of the rear, I guess thinking was that the rusted out rear boot floor would cause issues. A little overkill, but worth doing I suppose. The best thing about doing the work at HooverSpeed is the option of using a lift amongst other things. Just have the space to walk around the car is enough for me. Just some detail from under the car. Nothing totally awful here. 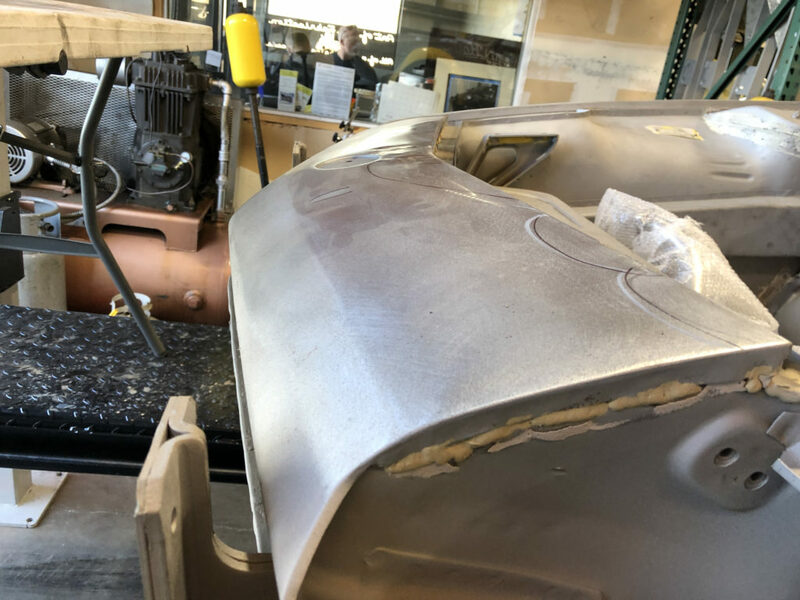 Most of those rust spots you see on the bottom quarter panel/connector is surface. 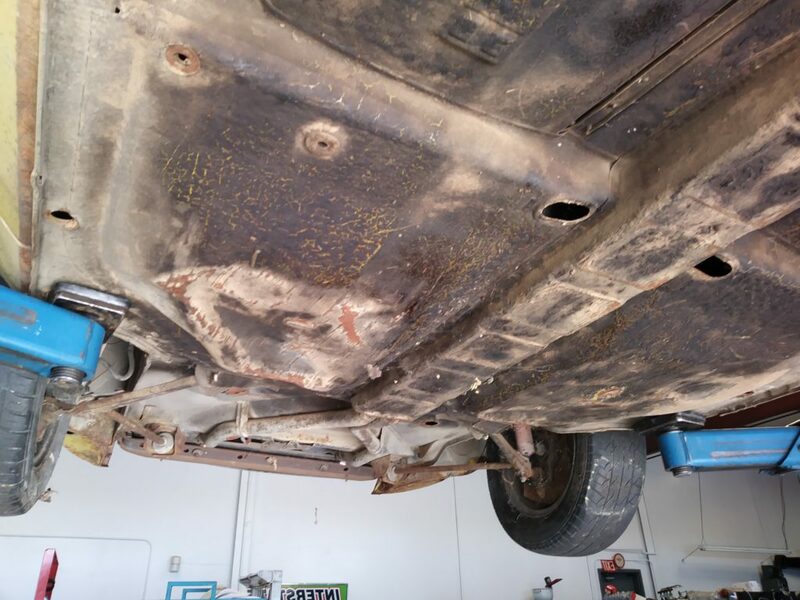 There are almost no rust-thru holes in the car with the exception of the rear boot. My first few days with the car at the shop was really just an exercise in removing a ton of stuff. 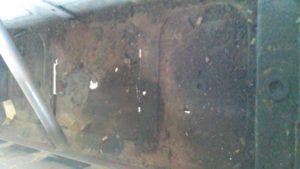 However, I managed to slip up to the shop Saturday June 10th, where I started the metal work on the engine bay. By metal work, I mean having fun with a plasma cutter. 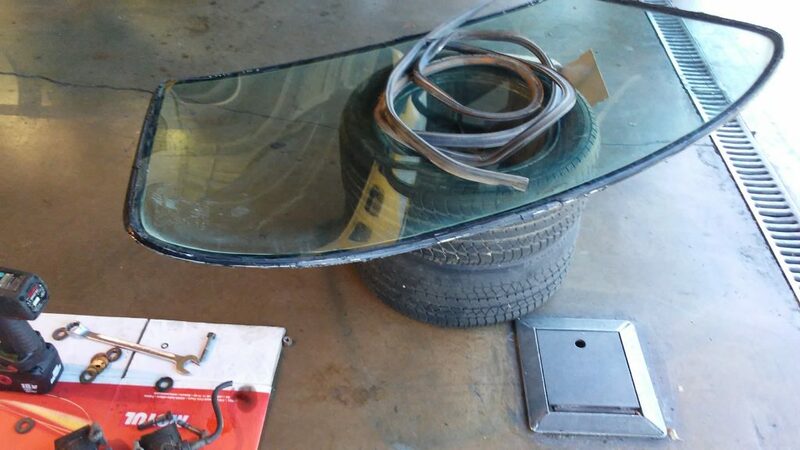 This resto-mod is going all the way down to metal, so removing the windshield is a must. I was lucky to have a local window/glass guy who does a lot of work for HooverSpeed and he had this glass out in about 10 minutes. I was pretty amazed he got it out without a crack. Actually, even more metal was eventually removed. 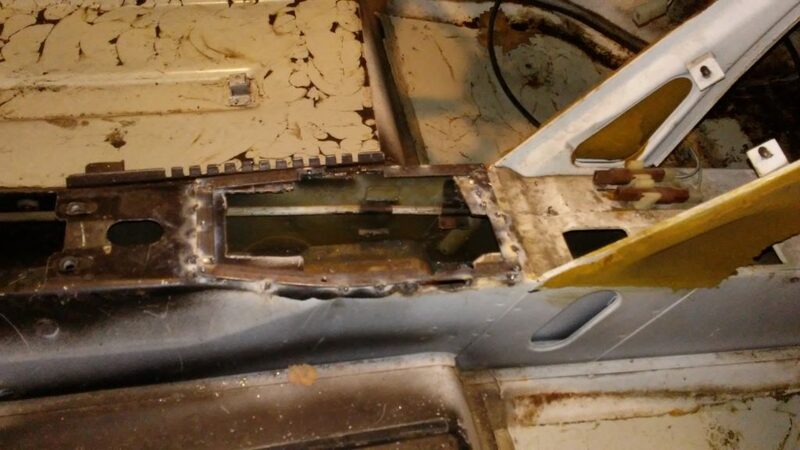 You can see the throttle body jets back into where the fuel tank would sit. The TB itself has an IAV control at the bottom of the unit that goes down and into the firewall. The valve is digitally controlled and can be programmed with Kpro or other ECU so I like to keep it. The latest on the 74 has become a little interesting. 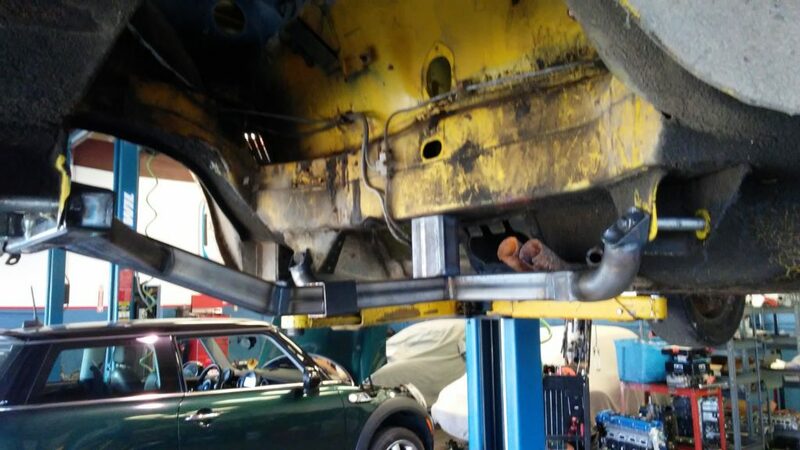 The first being to better restore the 74, we built a rotisserie to hold the chassis and move the car around with zero suspension. 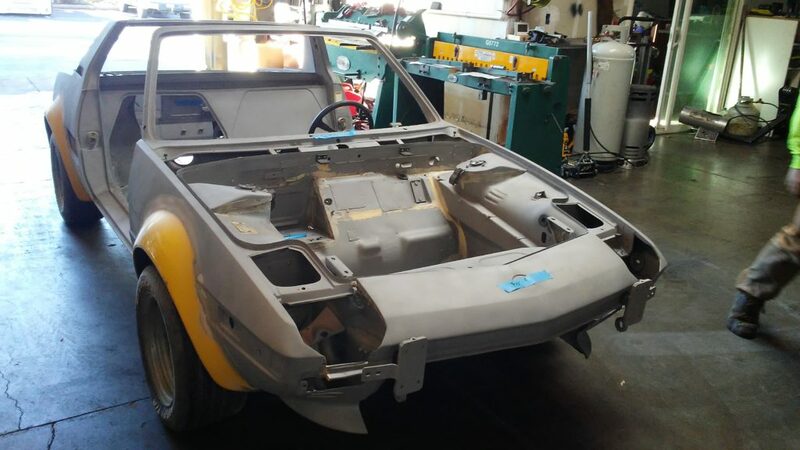 The chassis can spun 360 degrees, so any and all under carriage work is far easier now. How I am still getting little “surprises” here and there, mainly in the form of rust. So much so that I started to consider other chassis options. You will notice in the pic, the rear valance is severely smashed. 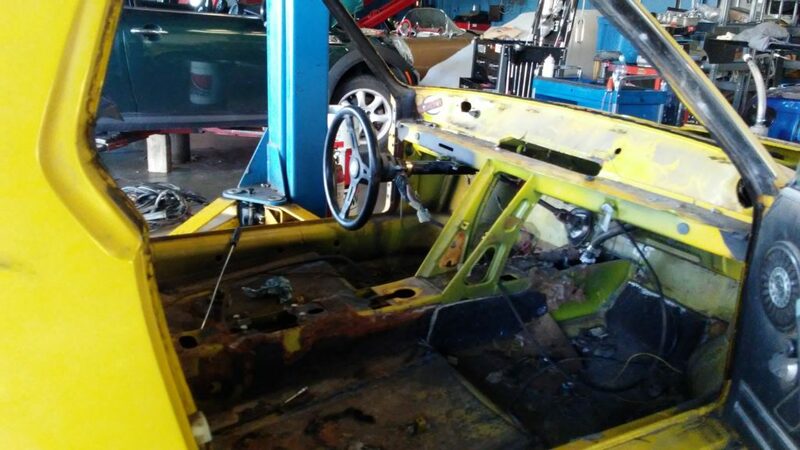 This actually happened in the shop where the car fell to the ground and landed in a jack. No one was hurt (other than car) but it was definitely a sad morning, considering it was one of the only bits on the car that was perfect and untouched. 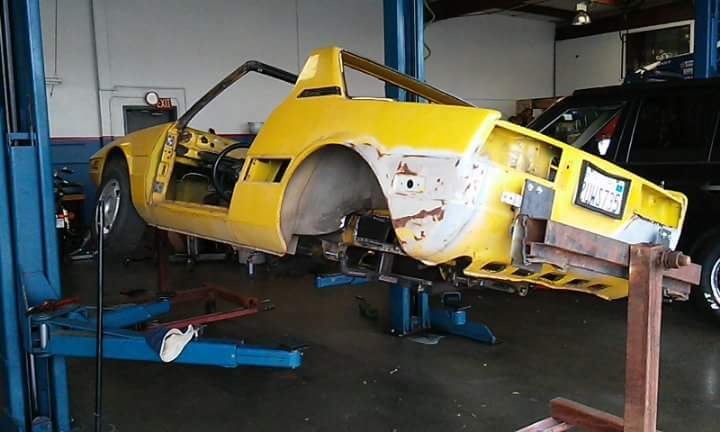 Well, as luck would have it – I found another 74 (yellow even) with a set of Bayless fender flares already installed. Amazingly, this 74 not only already has flares I was STRONGLY considering, it also has all of the common 74 specific bits and pieces including the very hard to find chrome the tail lights. After some negation, I decided to pull the trigger and get this car. It does have some nose damage, however considering the effort to repair (vs my current chassis) still well worth it. 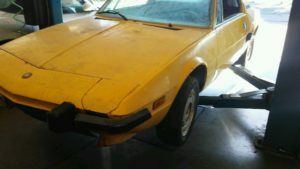 The car sits in my driveway, but will be traveling up to European Performance where I start tearing this one down and prep for the swap and restoration. The car was pretty much complete and even ran, although not very well. 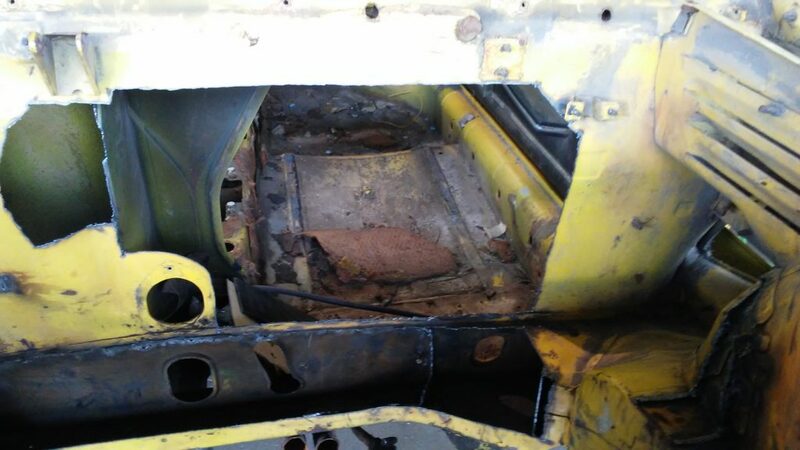 After completely stripping the car down to the chassis, I did the engine bay mods same as the other 74. 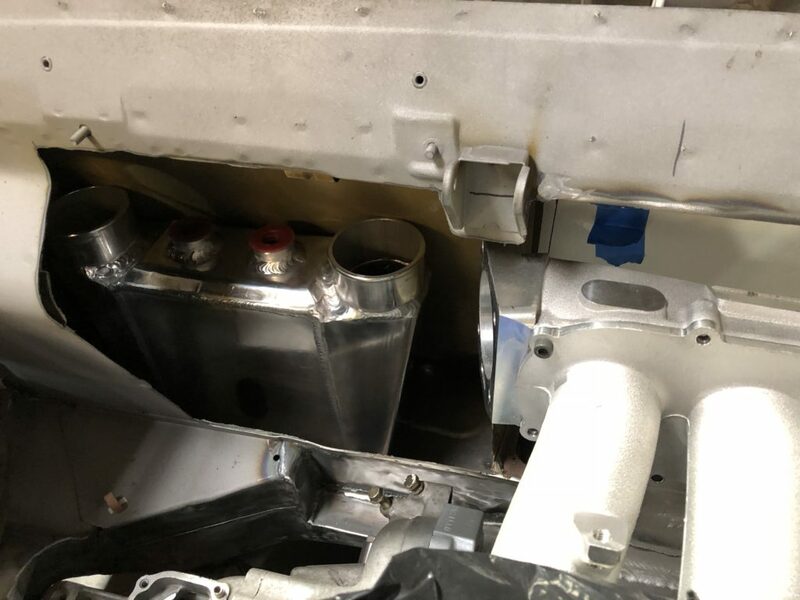 However, this time instead of cutting out the metal around the tank, I decided to reverse the direction of the intake manifold so the TB opening points to the right side of the engine. 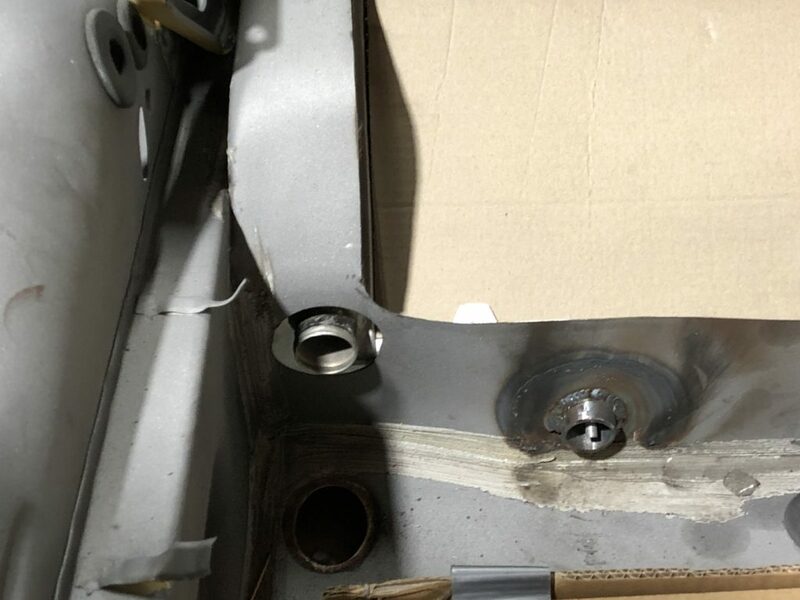 This meant NO metal cutting into the body engine bay where the fuel tank sits. 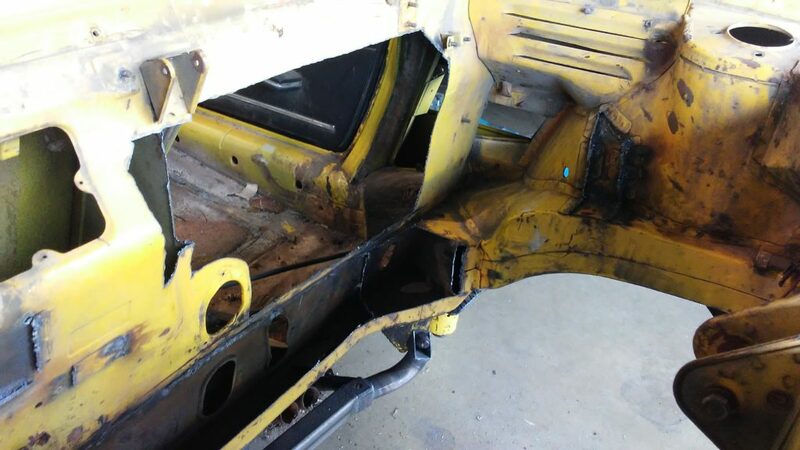 It did force me to trim a little more on the upper edge of the engine bay to spare wheel compartment. You can see, a MUCH cleaner install this way. 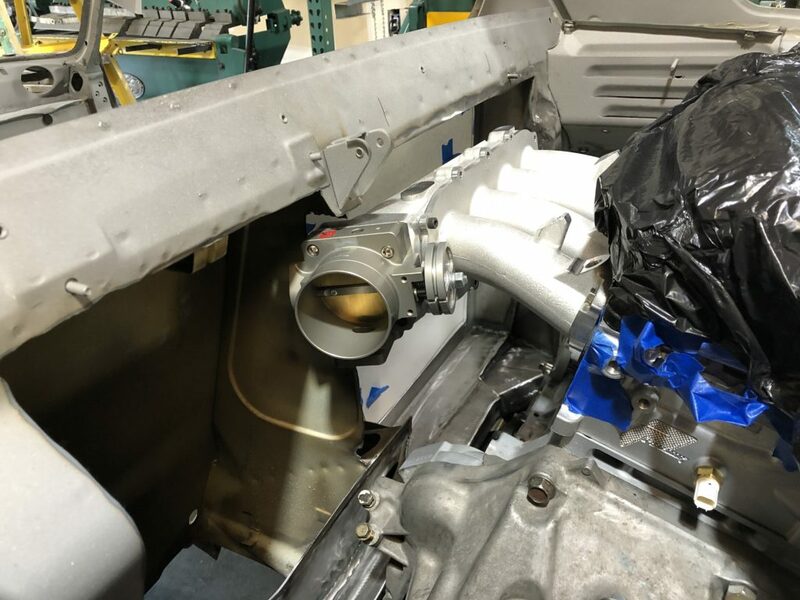 Problem now – the intake and TB are now in the way of both the custom pulley extension (supplied by Midwest-Bayless) and the stock tensioner as touching the upper portion of the waterpump manifold. Talking to my friend at DNR Performance, we started looking at alternative pulley systems, waterpumps and the like. 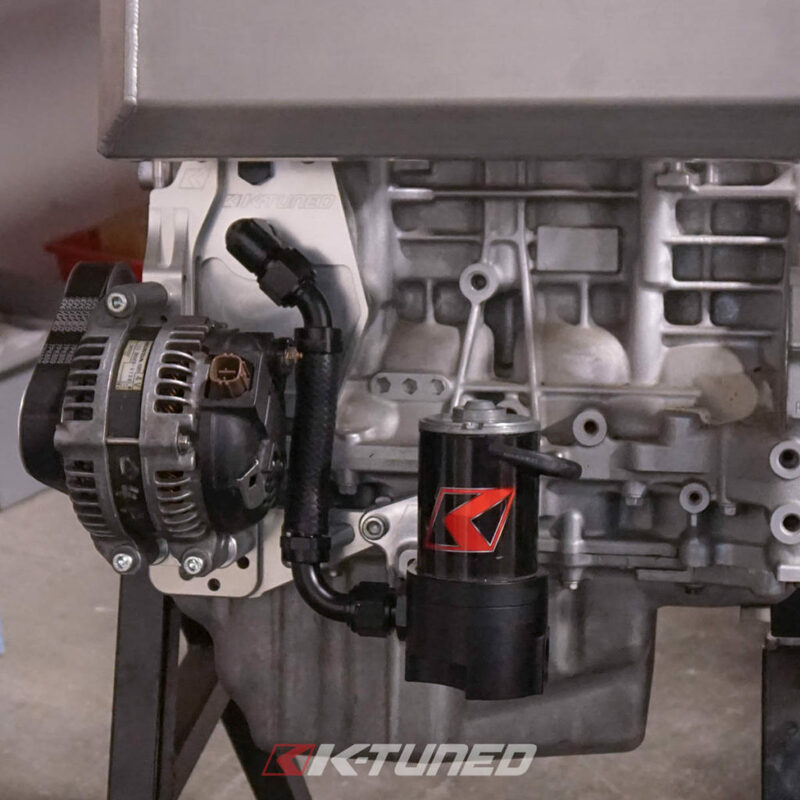 I ended up going with a kTuned electric water pump and replacement tensioner. A cleaner looking install and less ancillary pulleys being routed and driven. In this case, I am basically down to just the alternator. The waterpump manifold delete and new position of the tensioner totally free up the space where I needed under the intake mani and TB. Far more efficient cooling with a constant 20 GPM, regardless of RPMs. Also, I now have the option to run the pump with the engine on or off. So for track days or auto-x events, I can cool the engine while giving it a break (and shutting it off). MORE POWER! It’s a known fact, the less components you run off the crank pulley and you have less drag. Less drag means more HP available. 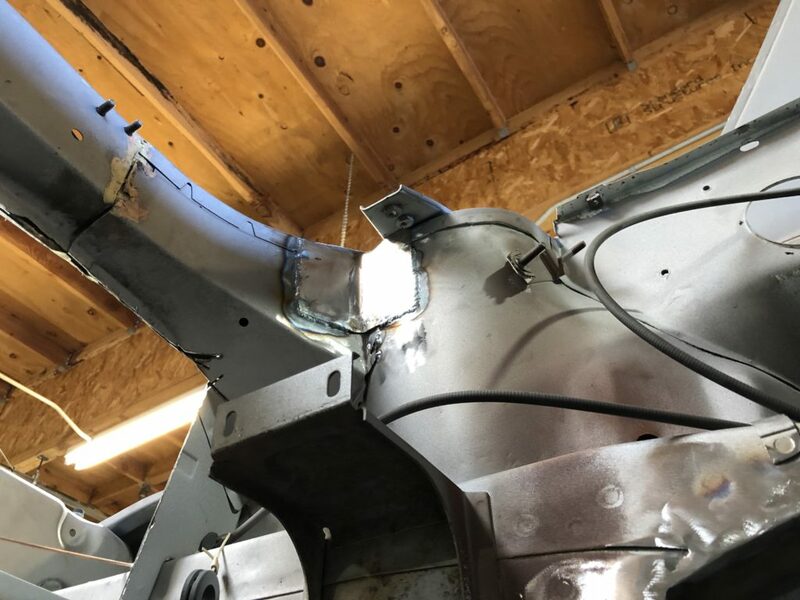 Sure enough, a little more metal had to come out, both at the base of the alternator as well as the side edge of the left of the opening. Additionally, I sliced the lower edge the aluminum bracket to give a little more room as well. 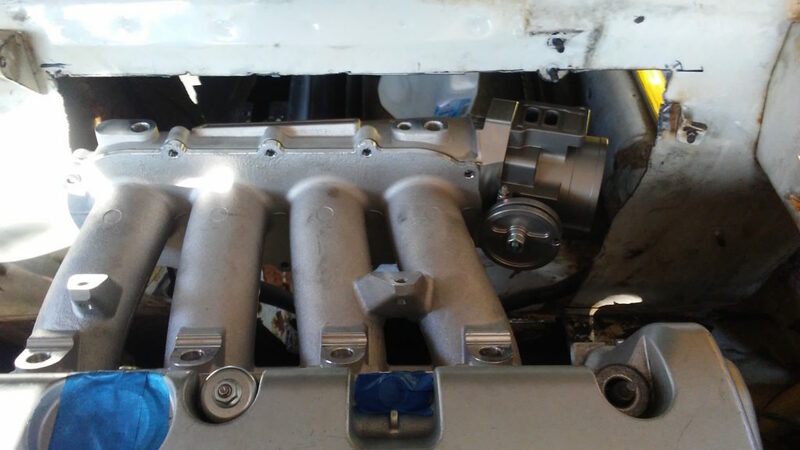 Its not easy to see in this pic, but the lower alternator bracket attaches to the custom engine mounts at the engine. It does make installing/removing a slight pain. As you can see in the previous post, I started modifying the engine bay preparing it for the k-series engine and trans. After a couple of test fits, I had everything where I wanted it. 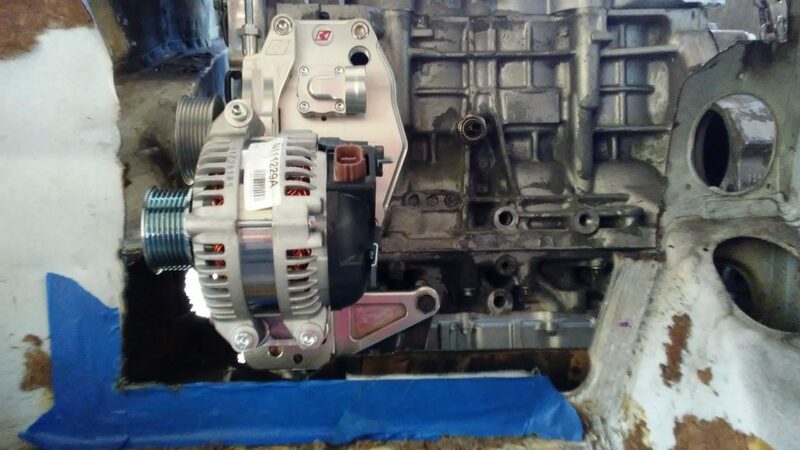 The relocated alternator was posed a clearance issues that began to address in the last pic (above). Eventually I had it where I needed it to fit so I began to put the metal back in. Here are a couple of pics of the welded bits back in. What you can’t see in the pic, is that I also added a long square channel that runs horizontally across the lower section, now covered with a 2″ x 1/8″ bar. This is by far WAY more sturdy than my prior k20 engine bay mod. 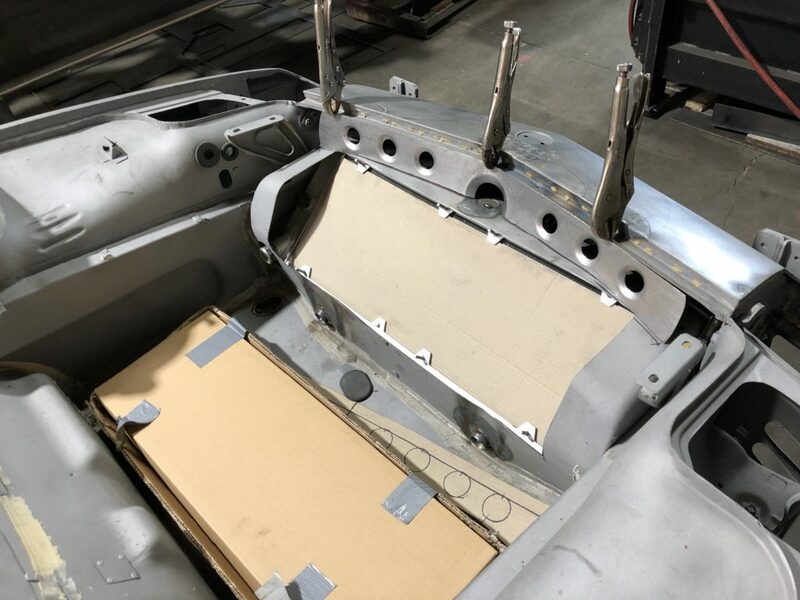 The only modification I need to make to the chassis in the cabin of the car is to cut and frame for the custom shifter. 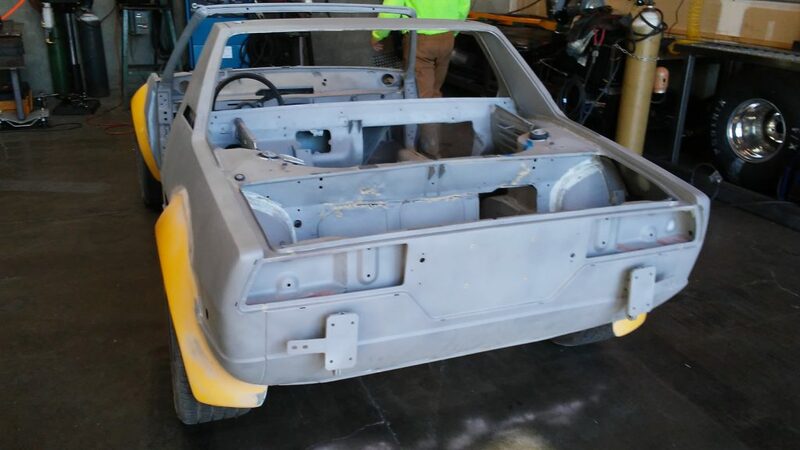 After nearly all of the chassis mods for the conversion were done, it was time to get the entire car media blasted. 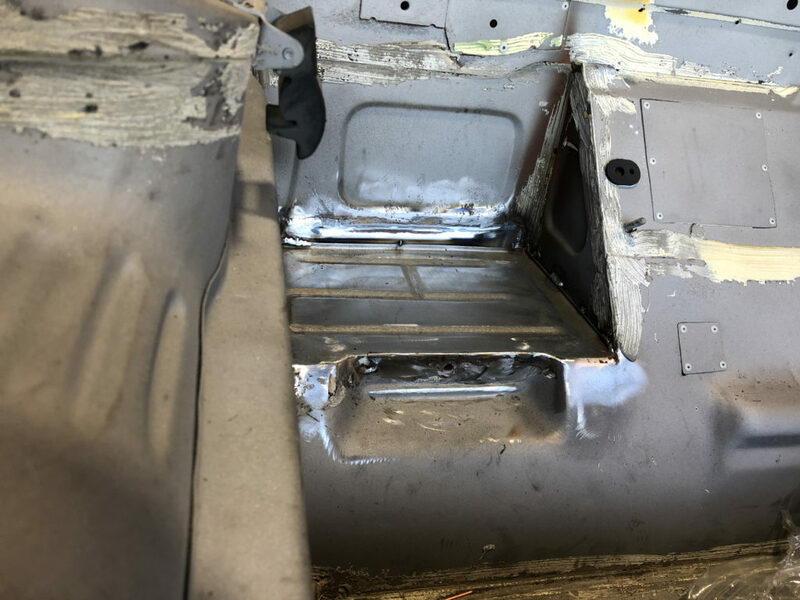 For the most part, the rust on this car was contained to the usual spots, however but getting the chassis blasted is the best way to remove ANY risks. Things had slowed down some on the 74 project typical of the holiday season and I ended up moving in late December, so I wasn’t able to get up to 74 much, but a few weekends here and there and we were able to get some metal work done. Hard to see in the pic above, but the battery tray was essentially rusted through so first order was to cut out/replace with some fresh metal. Pic from within the cabin. I have been wanting to re-do my last supercharged setup and this time improve on the design and with another project I picked up that will get the current k24/k20 motor, I decided to go SC on this car. The fuel cell will go in the front trunk aka – “frunk”, so the extra space this leaves behind will come in handy. 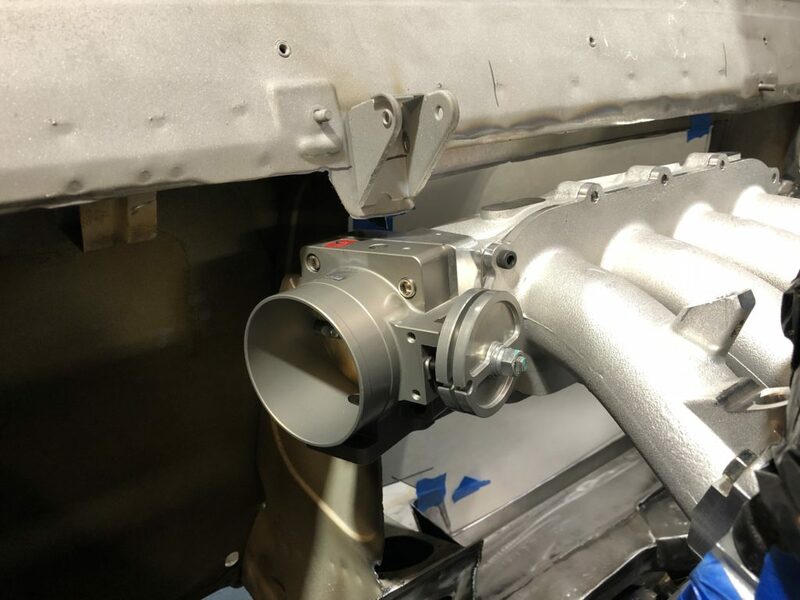 For one, we now have a large area farther away from the engine that can now house the intercooler. 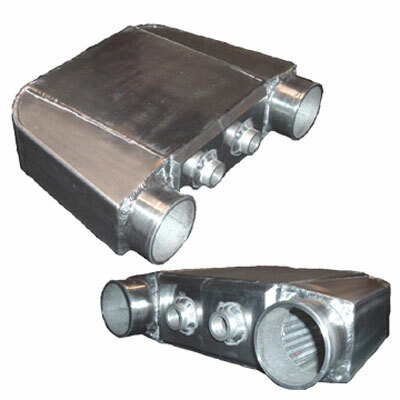 Also means we can route hydraulic lines easier and more efficiently. 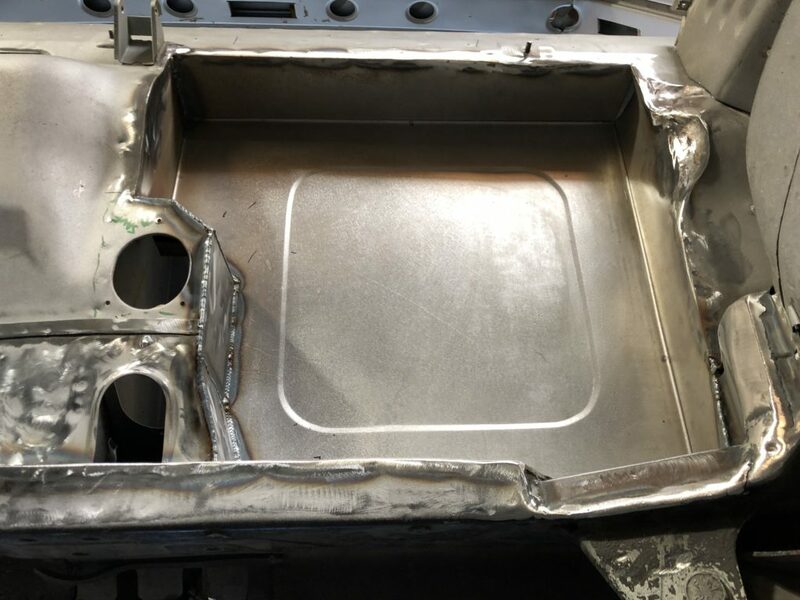 A larger intercooler box (16 inch x12.5 inch x 4.5 inch as appose to the 11 inch x 9 inch x 3.5 inch on the prior project) will fill some of the open space in the fuel tank tunnel. 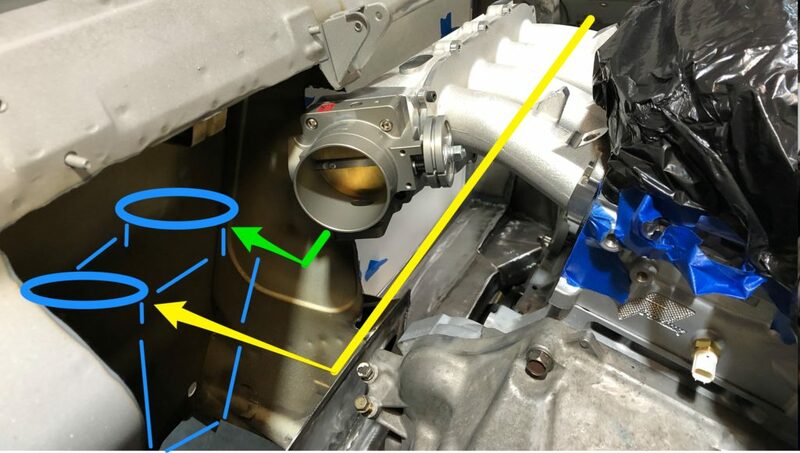 Pictured below is generally where the intercooler will go. 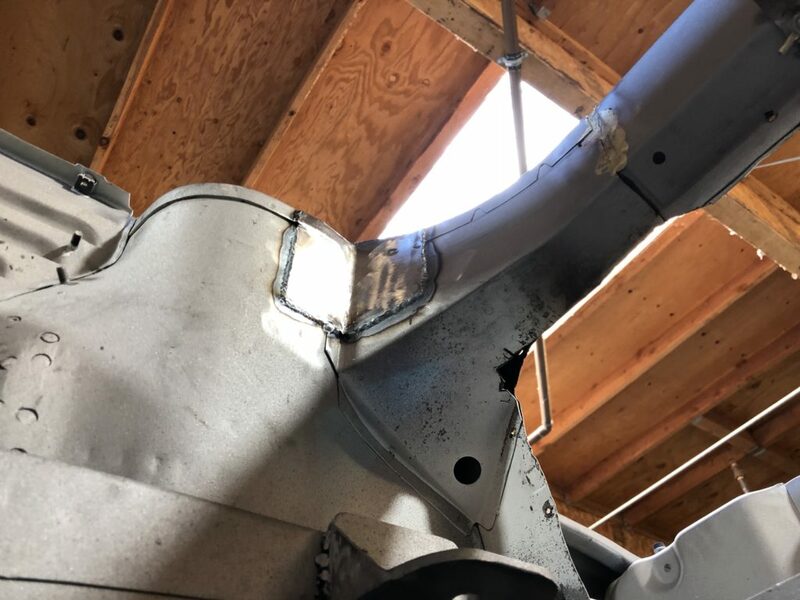 The inner left side of the cavity (not seen in the picture) is open to the side air inlet so should not get trapped hot air in/around it. I also moved the radiator back and up and cut the “hump” open to allow for venting through frunk lid. For ease of install, opened a spot for the radiator lower driver side outlet. 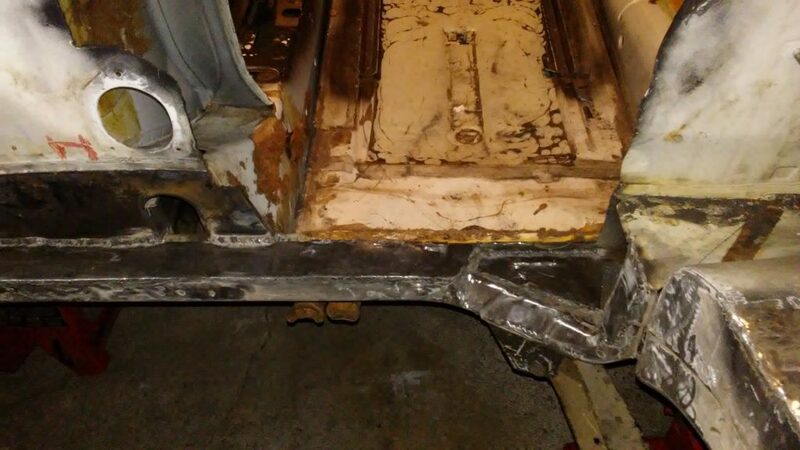 The hard lines that run under the car with turn upward to meet the radiator coming through the frunk floor.